What is high bay lighting? High bay lighting is the go-to solution in many workplaces for achieving bright and uniform illumination across large, high-ceilinged indoor spaces. It’s most often found in warehouses, department stores, manufacturing areas and sports halls. But what is high bay lighting exactly, and how does it differ from other high-intensity lighting solutions? Rather than any single fixture style, the term ‘high bay lighting’ refers to the positioning of the luminaires, and as such it covers a broad and flexible range of lamp types and fittings. As a rule of thumb, high bay lighting is usually the best option for any indoor setting where the floor-to-ceiling height measures 8m (roughly 25’) or taller. For less lofty spaces, low bays (or even a series of appropriately arranged floodlights) may be enough to get the job done. But, where indoor work areas span a great deal of vertical and horizontal space, the lighting solution needs to be both powerful and flexible. In this guide, we’ll tell you everything you need to know about the various types of high bay lighting configurations available, and the sorts of environment they’re best suited to. What’s the difference between high bay and low bay lighting? Low bay lighting setups, as the name suggests, are more commonly used where there’s less vertical distance for the light to cover. In these situations, lower mounting positions will often allow for a shallower lighting angle, making it easier to illuminate vertical surfaces or to create specific lighting effects in smaller zones. High bays are most often found in warehouses, gantries, above a large shop or conference floors, at sports facilities, in expansive factory or workshop environments...anywhere that needs uniform, brilliant illumination to maximise visibility and light quality over a wide area. Apart from the different mounting altitudes, another key contrast between high bay and low bay light setups is that high bays tend to rely on more careful consideration of layout, fittings and components. High bay lighting must be chosen and positioned to ensure the light they cast is strong, uniform, and equally effective at hitting both vertical and horizontal surfaces from a wider angle. To achieve this, high bay lighting tends to demand more exacting placement of lamps and reflectors. When configured properly, high bay setups can achieve superb quality and intensity of light across the entirety of a wide, tall space. What is High Bay lighting used for? High bay lighting is used wherever large expanses of indoor space make it a challenge to achieve bright and uniform illumination across the full work area. Ideally suited for this purpose, high bays are usually powerful fixtures that can be configured in a wide variety of setups to suit the precise needs of the user and the environment. High bay lights are available in numerous different fitting and reflector types, ranging from LEDs to metal halide bulbs, fluorescent tubes and plasma lamps. Different sorts of reflectors and fixture positions will deliver markedly different results, from intense overhead spotlighting effects to a softer, more diffuse glow spread over a wider area. Whichever configuration is best suited to your needs, remember that good lighting is first and foremost about safety and precision. In planning the installation of any high bay lighting setup, it’s crucial to consider the unique aspects of the environment in question, as well as the specific nature of the tasks being carried out in it. Warehouse lighting is one of the most common scenarios for high bay light setups, where huge interior dimensions can make these spaces inherently challenging to illuminate uniformly. Stacked goods and tall shelving can create areas of deep shadow that many low bay solutions will struggle to penetrate at shallower angles. There are dozens different configurations to choose from when installing warehouse high bay lighting. Given that many such workplaces operate 24 hours a day, LED high bay setups have become very popular due to their significantly lower running and maintenance costs over time. The initial outlay is usually higher than for traditional lamp fittings, but LEDs require drastically less frequent replacement, and consume only a fraction of the power while delivering a more intense and consistent quality of illumination. Traditional incandescent, fluorescent or metal halide lamps are also appropriate choices for many aspects of typical warehouse lighting. However, bear in mind that all of these alternatives will require more regular replacement and draw increased power in comparison to their more efficient LED counterparts. Among the most typical setups found in high bay shop lighting today is the widely used T5 or T8 fluorescent tube lamp. 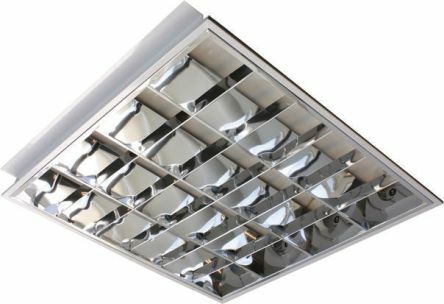 These are often seen mounted high above shop floors, usually recessed beneath large concave reflectors, helping them deliver bright and uniform lighting over wide areas. They’re particularly common in environments where surfaces are glossy, polished or reflective, which tends to suit the flat, colour-neutral and widely dispersed light quality of fluorescent lamps well. Industrial high bay lighting fixtures are another area in which modern LED configurations have gained major traction in recent years - largely because safety, precision and quality are key concerns in all industrial environments. Instant-on functionality, and suitability for use with microwave activation sensors, are both significant advantages of LED industrial lighting. Adaptable lighting setups are also valued in many industrial settings. LEDs are streets ahead of traditional lamps in that regard, often allowing for minute adjustment on the fly, and allowing users to create vastly different qualities and intensities of lighting in different zones of the workspace. Again, the 24-hour nature of many industrial and manufacturing facilities often means the higher initial investment in LED lamps is quickly offset by their far lower running costs. Vastly improved longevity and reliability also results in minimal downtime; another worthwhile consideration on fast-paced production lines. A high-functioning, safe and efficient loading bay is one of the most important links in the smooth supply chain of any warehouse, industrial, logistics or large retail space. Demand for around-the-clock access to these busy work areas makes installing a robust, well-planned loading bay lighting solution absolutely vital. Suitable loading bay setups must effectively light all general goods handling, traffic and transfer zones to maximise worker safety and efficiency. It’s also important to consider where additional functionality might be required to meet the exacting demands of a multi-space loading bay. Adjustable dock guide lights, for example, are extremely helpful for illuminating the interior of vehicles, crates and containers to help reduce the risk of damage or injury as a product is brought in and out. High-quality garage lighting is crucial for maximising efficiency and quality of work, as well as for standing up to the challenges of a shop floor or service area that lower grade setups might struggle in. Particulates, fumes and other pollutants can quickly occlude or damage high or low bay fixtures that aren’t up to the rigours of the environment, resulting in severely compromised quality and consistency of lighting. Popular choices for high bay lights in garages, workshops and servicing facilities include both fluorescent and LED lamp setups. This is due to their suitability for use in environments where excellent colour rendition and minimal glare are needed to achieve the highest standards of craftsmanship, finishing and attention to detail. HTML Source EditorWord Wrap As noted in the various examples outlined above, there’s a wide range of different high bay lighting setups available. Each has its own unique benefits or potential limitations, depending on the demands of the space and the types of work being carried out. almost all large warehouse, factory, production, commercial or service areas. Initial investment in a high bay LED setup will be more expensive than most other fixture types, but once installed the long-term running costs are minimal in comparison. bills (depending on the specifics of the setup and intensity of use), and the lifespan of an LED bulb is typically many times longer than that of metal halide or fluorescent lamps. High bay LED fittings illuminate to full intensity instantly, rather than having to ‘warm-up’ like many other lamp types. They’re also suitable for use with microwave sensors without degrading the lifespan of the lamp, which allows for true wide-aspect motion detection over large areas (as opposed to PIR sensors, which rely on detecting body heat and are ineffective in bigger or awkwardly shaped spaces). intense lighting over a smaller area. T8 high bay fluorescent lights are the more ‘traditional’ configuration of the standard tube strip, with a 1” diameter and excellent colour rendering, making them particularly suitable for commercial, servicing and workshop setups. The wider gauge tubes mean the beam angle is also less acute, and so the light they give off is more diffuse and even (though slightly less intense) over a wider area than their smaller T5 counterparts. Be aware that the different standard fittings for T5 and T8 high bay fluorescent lights don’t usually allow for a straight swap between the two tube types, so you’ll need to know what hardware changes are required if you’re considering an upgrade or a switch. 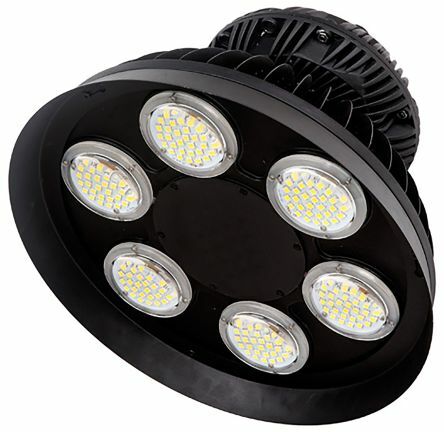 Plasma high bay lighting generally offers longer bulb lifespans, improved colour rendition, higher lumens and better dimmable performance than traditional HID lamps (such as metal halide or sodium). 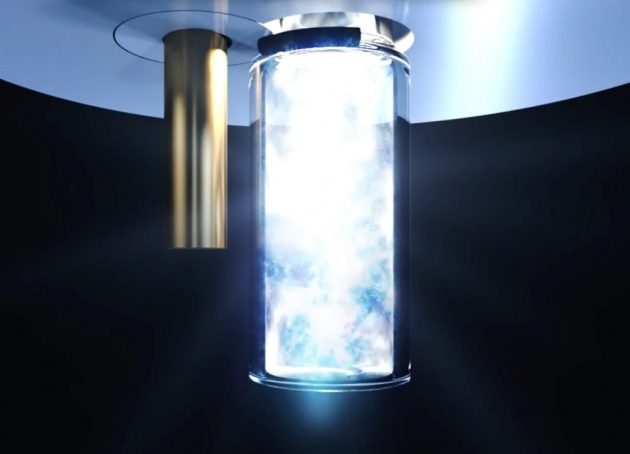 Plasma setups are less expensive to install than a full LED system, but can often deliver comparable light quality and intensity - albeit with a few more limitations in terms of adaptability (they operate within a finite range of orientation) and overall efficiency. Also suitable for use with true motion sensor technologies, plasma high bays are an excellent choice for many work environments where full freedom of orientation isn’t a necessity. Retrofitting simply refers to upgrading an existing high bay lighting setup with more powerful, modern and/or efficient lamps. In most cases, this tends to mean carrying out an LED high bay lighting retrofit, by far the most common type of retrofitting we see today. Your potential for carrying out a high bay lighting retrofit relies to a large extent on the compatibility of your existing fixtures, and the range of energy-efficient lamps available at the size and specifications you need. Options are expanding all the time, with a number of high-end brand names now offering their own product ranges suitable for an increasing number of retrofit jobs (for example the well-regarded line of Philips high bay fixtures). Just like with the numerous varieties of high bay lamps themselves, there’s a wide range of high bay fixtures and fittings available when planning a lighting configuration for a large and high-ceilinged workspace. 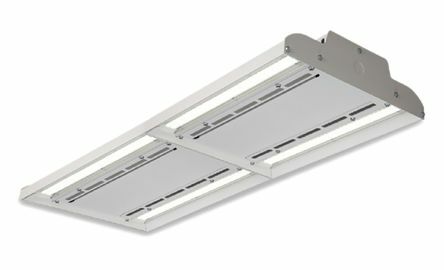 T-bay fixtures are similar in design to the sorts of recessed lighting often seen in offices and retail spaces, but they can be surface mounted or suspended from ceilings. Typically based on a familiar multi-tube setup, nowadays it’s common to see various configurations of LED tubes used in place of the standard fluorescent T8s or T5s. T-bay lighting is a popular option when retrofitting a space with an older infrastructure, and they make great replacements for older-style HID high bay lamps due to their much-improved efficiency, without compromising light quality or warm-up time. A strange-sounding term that not everyone will be familiar with - so what is troffer lighting? You’re probably used to hearing it called ‘recessed lighting’, which more or less explains it: a troffer light is simply a lighting fixture that’s embedded into the ceiling grid, and thus retains a fixed and permanent position. Metal halide high bay light fixtures radiate an intense light, given off by the interaction of halogen and metallic elements under an electric current. They’re much more efficient - and give off a far better quality of light, thanks to the metals - than traditional incandescent bulbs. The high colour temperature of metal halide lamps means they’re great for environments where starkness and clarity are important, and the fact that they’re omnidirectional makes them a natural fit for lighting very wide areas such as sports stadia and car parks. However, the latter can also be a downside in some indoor spaces, where omnidirectional lighting is less efficient than light directed towards a specific area of need. They also have a considerably slower warm-up than most other types of lamp. That’s also less efficient, and makes them unsuitable for use as emergency lighting - you’ll need to know in advance when they’re needed, and power them on a good while before they’ll reach their full potential. HID lighting - standing for high-intensity discharge - has long been a common standard across many high bay setups, and remains an attractive option in scenarios where the extra initial cost of LED alternatives won’t quickly be offset by reduced energy bills. Bright, intense, and notable for the high colour temperature typical of most gas-discharge arc lamps, HID high bay lighting setups are an effective choice wherever large floods of sharp light are needed over a wide area. However, a much slower warm-up time and lower efficiency rating means they’re not always the ideal solution for every environment, particularly where instant illumination or very prolonged use is needed. There are many variables to weigh up in terms of available products, mounting solutions and short/long-term cost-effectiveness when deciding on a high bay lighting setup for your large, high-ceilinged workspace. Whether you opt for standard lower-cost HID lamps, or the longer-lasting and far more energy-efficient LED versions, a properly planned and installed high bay lighting system will give you excellent coverage and quality of light across an expansive area. This will, in turn, make any large indoor zones much safer and more comfortable spaces in which to perform high quality, efficient work. For any further questions or information regarding lamp types, mounting solutions or any other aspect of high and low bay lighting setups, please feel free to contact our expert customer service team who will be happy to advise and assist you. Which is the best High Bay Lighting to use?